Points of interest in Shasta County include Shasta Lake, Lassen Peak, and the Sundial Bridge. The county was named after Mount Shasta; the name is derived from the English equivalent for the Shasta people, the name of a Native American tribe that once lived in the area, but they were ethnically cleansed from the area in the 1850's. The name of the tribe was spelled in various ways until the present version was used when the county was established. Originally Mt. Shasta was within the county, but it is now part of Siskiyou County, to the north. 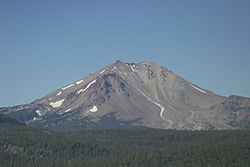 Its 14,179-foot (4,322 m) peak is visible throughout most of Shasta County. According to the U.S. Census Bureau, the county has a total area of 3,847 square miles (9,960 km2), of which 3,775 square miles (9,780 km2) is land and 72 square miles (190 km2) (1.9%) is water. Mountains line the county on the east, north and west. The Sacramento River flows out of the mountains to the north, through the center of the county, and toward the Sacramento Valley to the south. According to Willis Linn Jepson the biota of Shasta County were not explored in a scientific manner until just before the year 1900. Up until the 1920s the Southern Pacific Railroad Company owned vast tracts of natural grasslands; however, during the 1920s the railroad sold off much of its grassland holdings, leading to the rapid clearing of brush and large scale conversion from habitat to agricultural uses. Shasta County has extensive forests, which cover over one half the land area with commercially productive forest systems. Common forest alliances include mixed oak woodland and mixed conifer-oak woodland as well as douglas fir forest. Common trees found include White-bark pine, California Black Oak and California Buckeye. Shasta at one time favored the Democratic Party in Presidential elections. It went Democratic in all but one presidential election from 1932 to 1976, and was one of the few counties in the state to be won by George McGovern. However, since 1980, it has become one of the most Republican counties in the state in Presidential and congressional elections. The last Democrat to win a majority in the county was Jimmy Carter in 1976. In the United States House of Representatives, Shasta County is in California's 1st congressional district, represented by Republican Doug LaMalfa. In the California State Legislature, Shasta County is in the 1st Senate District, seat currently vacant, and the 1st Assembly District, represented by Republican Brian Dahle. Redding Area Bus Authority (RABA) provides service in and around Redding. One route operates to Burney via State Route 299. Amtrak's Coast Starlight serves Redding Station once a day in each direction. Redding Municipal Airport has scheduled passenger flights. Other (general aviation) airports within the county include Benton Field (near Redding), Fall River Mills Airport, and Shingletown Airport. The 2010 United States Census reported that Shasta County had a population of 177,223. The racial makeup of Shasta County was 153,726 (86.7%) White, 1,548 (0.9%) African American, 4,950 (2.8%) Native American, 4,391 (2.5%) Asian, 271 (0.2%) Pacific Islander, 4,501 (2.5%) from other races, and 7,836 (4.4%) from two or more races. Hispanic or Latino of any race were 14,878 persons (8.4%). As of the census of 2000, there were 163,256 people, 63,426 households, and 44,017 families residing in the county. The population density was 43 people per square mile (17/km²). There were 68,810 housing units at an average density of 18 per square mile (7/km²). The racial makeup of the county was 89.3% White, 0.8% Black or African American, 2.8% Native American, 1.9% Asian, 0.1% Pacific Islander, 1.7% from other races, and 3.5% from two or more races. 5.5% of the population were Hispanic or Latino of any race. 15.7% were of German, 12.3% English, 11.2% Irish, 9.9% American and 5.2% Italian ancestry according to Census 2000. 94.0% spoke English and 3.3% Spanish as their first language. There were 63,426 households out of which 31.7% had children under the age of 18 living with them, 53.0% were married couples living together, 11.9% had a female householder with no husband present, and 30.6% were non-families. 24.7% of all households were made up of individuals and 10.2% had someone living alone who was 65 years of age or older. The average household size was 2.52 and the average family size was 2.98. In the county, the population was spread out with 26.1% under the age of 18, 8.2% from 18 to 24, 25.3% from 25 to 44, 25.2% from 45 to 64, and 15.2% who were 65 years of age or older. The median age was 39 years. For every 100 females there were 95.1 males. For every 100 females age 18 and over, there were 91.2 males. The median income for a household in the county was $34,335, and the median income for a family was $40,491. Males had a median income of $35,959 versus $24,773 for females. The per capita income for the county was $17,738. About 11.3% of families and 15.4% of the population were below the poverty line, including 21.0% of those under age 18 and 7.3% of those age 65 or over. The sheriff provides court protection, prison administration and coroner services for the entire county and patrol, investigative, and coroner services for the unincorporated portions of the county. Redding and Anderson have municipal police departments. Median price for a house is about $183,000 as of early 2014. Median rental rate is $700/month. Bailey Cove Campground near Lake Shasta within the Shasta-Trinity National Forest. 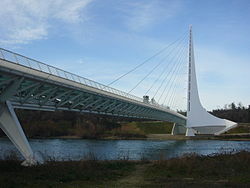 Sundial Bridge/Turtle Bay, an architectural beauty and a natural habitat area surrounded by urbanization. The population ranking of the following table is based on the 2010 census of Shasta County. ^ Clarke, Chris. "Untold History: The Survival of California's Indians". ^ Leip, David. "Dave Leip's Atlas of U.S. Presidential Elections". Uselectionatlas.org. Retrieved 7 November 2017. ^ "Zillow". Zillow.com. Retrieved 23 February 2014. ^ "Census Coverage Measurement". Census.gov. Retrieved 7 November 2017. ^ "2010 Census Interactive Population Search : Redding Rancheria". Census.gov. Retrieved 7 November 2017. ^ "2010 Census Interactive Population Search : Roaring Creek Rancheria". Census.gov. Retrieved 7 November 2017. ^ "2010 Census Interactive Population Search : Montgomery Creek Rancheria". Census.gov. Retrieved 7 November 2017. ^ "2010 Census Interactive Population Search : Big Bend Rancheria". Census.gov. Retrieved 7 November 2017. 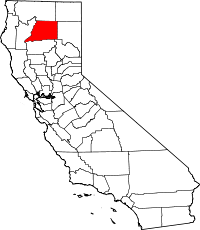 Wikimedia Commons has media related to Shasta County, California.